The topics covered in this volume include Sobolev's fundamental works on equations of mathematical physics, computational mathematics, and cubature formulas. Some of the articles are generally unknown to mathematicians because they were published in journals that are difficult to access. This is the first appearance in English of many works by this important Russian mathematician. Illustrations note 15 Tables, black and white; 20 Illustrations, black and white; XXVIII, 604 p. 20 illus. S.L. Sobolev (1908-1989) was a great mathematician of the twentieth century. His selected works included in this volume laid the foundations for intensive development of the modern theory of partial differential equations and equations of mathematical physics, and they were a gold mine for new directions of functional analysis and computational mathematics. 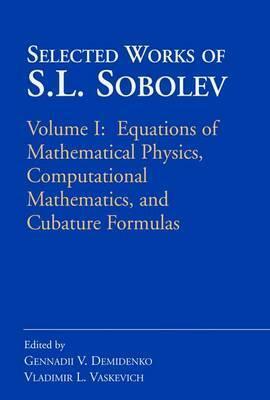 The topics covered in this volume include Sobolev's fundamental works on equations of mathematical physics, computational mathematics, and cubature formulas. Some of the articles are generally unknown to mathematicians because they were published in journals that are difficult to access. This book is intended for mathematicians, especially those interested in mechanics and physics, and graduate and postgraduate students in mathematics and physics departments.